With a background in magnetic resonance physics, Rebecca spent her PhD studies developing advanced functional magnetic resonance imaging techniques to observe the changes in brain activity, functional connectivity and cerebral perfusion caused by the onset of disease or the administration of a drug. Rebecca has conducted studies into the effect medicines on brain activity, and the effect of deafness and hearing loss on how our brains process sound, vision and touch. Rebecca uses many different neuroimaging techniques, often in combination with each other. She has experience working with functional magnetic resonance imaging (fMRI), using the blood-oxygenation level dependent (BOLD) effect, and using perfusion with arterial spin labelling (ASL). She also uses near-infrared spectroscopy (NIRS), electroencephalography (EEG) and the auditory brainstem response (ABR). 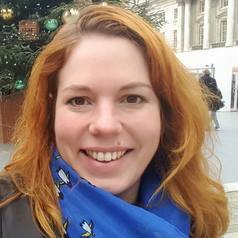 Rebecca's current work is in the area of hearing research, measuring the effect of noise exposure on how our brains process sounds, and also measuring brain activity in profoundly deaf individuals, in order to investigate whether these patterns change with cochlear implant use.